Their wide range of delicious fruits and healthy grains is ideal for your 4-6 month old baby - smooth in texture, simply flavoured, and with key nutrients. ... They can trace every one of this porridge's 7 grains back to the expert farmer who grew it and the field from which it came. 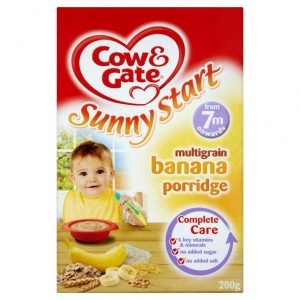 Baby-Grade Banana*, Demineralised Whey Powder (from Milk), Milled Cereals* (Corn, Rice), Skimmed Milk Powder*, Vegetable Fat (contains Emulsifier Soy Lecithin), Calcium, Vitamins†, Iron, Zinc, †Vitamins: Vitamin C, Niacin, Vitamin E, Pantothenic Acid, Thiamin (B1), Vitamin B6, Vitamin A, Folic Acid, Biotin, Vitamin D3, *Prepared with 61g Banana, 47g Fortified Milk and 26g Cereal per 100g dry product. Values per 100g dry product : Energy 1829kJ/435kcal, Fat 13g, of which, saturates 5.4g, Carbohydrate 63.4g, of which, sugars 41.8g, Fibre 3.8g, Protein 14.1g, Salt 0.33g, Vitamin A 305µg, Vitamin D 11.6µg, Vitamin E 5mg, Vitamin C 39mg, Thiamin (B1) 0.8mg, Riboflavin (B2) 0.8mg, Niacin 10.1mg NE, Biotin 11µg, Folic acid 60µg, Pantothenic acid 3mg, Calcium 690mg, Iron 5.7mg, Zinc 5.3mg,*LRV (Labelling Reference Value) is a guide to the amount of vitamins or minerals needed per day to meet the requirements of infants and young children. Using a clean bowl and feeding spoon, mix 1 spoon of cereal with 3 spoons of cooled boiled water and stir.